These lesions are almost always unilateral and can be associated with other lung lesions such as bronchopulmonary sequestrations and congenital lobar emphysema. [5, 6, 7] The vascular supply and drainage from CPAMs is almost always to the pulmonary circulation; however, bronchopulmonary sequestrations may be connected to the systemic circulation. The cause of CPAM is unknown, but several hypotheses have been advanced. One prevailing theory is that CPAM is caused by airway obstruction. The different presentation and types of lesions are accounted for by the timing and location of obstruction. [2, 11] It has also been proposed that an imbalance between cell proliferation and apoptosis during airway branching morphogenesis may lead to CPAM. [12, 13] Dysregulation the genes HOXB5  and glial cell-derived neurotrophic factor  have also been implicated in CPAM pathogenesis. The expanded use of prenatal ultrasonography (see the images below) has increased the recognition of CPAMs and has helped characterize their natural history. [5, 8, 9] Prenatal therapy for CPAM is considered if the affected fetus begins to show signs of hydrops fetalis. Although the natural history of CPAMs varies, several trends have been described. Sonographic images of fetal congenital pulmonary airway malformation. (A) Microcystic congenital pulmonary airway malformation, with ultrasound showing a solid echogenic mass. (B) Macrocystic congenital pulmonary airway malformation, with one or more cysts >5 mm. Microcystic lesions typically have a rapid growth phase between 20 and 26 weeks’ gestation that usually peaks at about 25 weeks. Subsequently, growth of these lesions plateaus. In many cases, the lesions actually regress, [16, 17] and some disappear completely. [18, 19] Macrocystic lesions may grow rapidly throughout gestation and do not have the characteristic pattern of growth through the late second trimester with subsequent plateau or decrease in size. 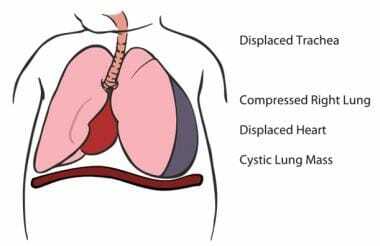 Diagram of cystic lung mass compressing the lung and displacing the mediastinum. Illustration by Colin Fahrion, University of California-San Francisco. The use of steroid therapy is clearly indicated for microcystic CPAMs that have resulted in hydrops. There is minimal maternal morbidity associated with this intervention, and efficacy is superior to fetal resection. 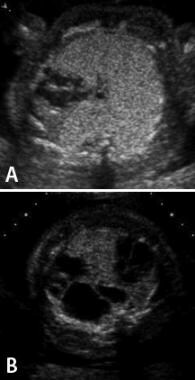 Uncertainty remains about nonhydropic fetuses with large microcystic CPAMs. A randomized trial led by the University of California, San Francisco, attempted to address the use of steroids in this context, but recruitment was hampered because of the increasing use of maternal steroids for nonhydropic microcystic CPAMs. In most centers, steroids are administered for microcystic CPAMs with a CVR greater than 1.0. Simple cyst aspiration usually precedes thoracoamniotic shunt placement to ensure the efficacy of CPAM fluid removal. Gestational age should be greater than 20 weeks and less than 32 weeks. The risk of chest-wall deformity is extremely high if catheter-based interventions are pursued before 20 weeks. After 32 weeks, delivery and neonatal resection are indicated rather than prenatal therapy. Shunt choice also changes with gestational age. Before 24-25 weeks, Harrison shunts (Cook Medical, Bloomington, IN) are preferred because of their smaller size. After 25 weeks, Rocket shunts (Rocket Medical, Hingham, MA) are preferred because of the decreased likelihood of migration and ease of insertion. Fetal resection of CPAMs is much less common than steroid therapy, owing to the efficacy of maternal steroid administrations. The general consensus is that large microcystic lesions that threaten fetal well-being are best treated with steroid therapy. Macrocystic lesions are best treated with catheter-based therapies. If steroids are ineffective, open fetal resection can be used as salvage therapy. In rare cases, hydrops and fetal compromise can occur in or persist into the third trimester. In these cases, the CVR is typically greater than 1.6-2.0, and significant respiratory distress is anticipated at birth. The ex-utero intrapartum treatment (EXIT) procedure utilizes the placenta for gas exchange so that the fetal lungs can be bypassed while airway access is gained and lung lesions can be resected. Contraindications for macrocystic drainage include a predominately solid CPAM, abnormal fetal karyotype, severe fetal cardiac abnormalities or lack of a window for uterine access. Other associated congenital abnormalities may also represent contraindications but need to be considered on a case-by-case basis. Contraindications for fetal resection include significant maternal operative risk, abnormal fetal karyotype, and fetal cardiac abnormalities. Other associated congenital abnormalities may also represent contraindications but need to be considered on a case-by-case basis. The EXIT procedure requires maternal laparotomy and hysterotomy. If maternal health is significantly endangered by these interventions, EXIT should not be performed. Overall survival data for thoracoamniotic shunts for macrocystic CPAM can be derived from the aggregation of several small reports of its use. In a study by Wilson, 26 of the 41 patients treated survived (63%). A large single-center report by Peranteau et al described thoracoamniotic shunt placement in 38 patients with macrocystic lung lesions that were either causing hydrops or believed to be at high risk for causing lung hypoplasia. Hydrops was present in 69% of the population. Overall survival in this group was 73%. Adzick NS. Management of fetal lung lesions. Clin Perinatol. 2009 Jun. 36(2):363-76, x. [Medline]. Shanti CM, Klein MD. Cystic lung disease. Semin Pediatr Surg. 2008 Feb. 17(1):2-8. [Medline]. Adzick NS, Harrison MR, Crombleholme TM, Flake AW, Howell LJ. Fetal lung lesions: management and outcome. Am J Obstet Gynecol. 1998 Oct. 179(4):884-9. [Medline]. Curran PF, Jelin EB, Rand L, et al. Prenatal steroids for microcystic congenital cystic adenomatoid malformations. J Pediatr Surg. 2010 Jan. 45(1):145-50. [Medline]. Ankermann T, Oppermann HC, Engler S, Leuschner I, Von Kaisenberg CS. Congenital masses of the lung, cystic adenomatoid malformation versus congenital lobar emphysema: prenatal diagnosis and implications for postnatal treatment. J Ultrasound Med. 2004 Oct. 23(10):1379-84. [Medline]. Cass DL, Crombleholme TM, Howell LJ, Stafford PW, Ruchelli ED, Adzick NS. Cystic lung lesions with systemic arterial blood supply: a hybrid of congenital cystic adenomatoid malformation and bronchopulmonary sequestration. J Pediatr Surg. 1997 Jul. 32(7):986-90. [Medline]. Maas KL, Feldstein VA, Goldstein RB, Filly RA. Sonographic detection of bilateral fetal chest masses: report of three cases. J Ultrasound Med. 1997 Oct. 16 (10):647-52. [Medline]. De Santis M, Masini L, Noia G, Cavaliere AF, Oliva N, Caruso A. Congenital cystic adenomatoid malformation of the lung: antenatal ultrasound findings and fetal-neonatal outcome. Fifteen years of experience. Fetal Diagn Ther. 2000 Jul-Aug. 15(4):246-50. [Medline]. Taguchi T, Suita S, Yamanouchi T, et al. Antenatal diagnosis and surgical management of congenital cystic adenomatoid malformation of the lung. Fetal Diagn Ther. 1995 Nov-Dec. 10(6):400-7. [Medline]. Harrison MR, Bjordal RI, Langmark F, Knutrud O. Congenital diaphragmatic hernia: the hidden mortality. J Pediatr Surg. 1978 Jun. 13(3):227-30. [Medline]. Kunisaki SM, Fauza DO, Nemes LP, et al. Bronchial atresia: the hidden pathology within a spectrum of prenatally diagnosed lung masses. J Pediatr Surg. 2006 Jan. 41(1):61-5; discussion 61-5. [Medline]. Cass DL, Quinn TM, Yang EY, et al. Increased cell proliferation and decreased apoptosis characterize congenital cystic adenomatoid malformation of the lung. J Pediatr Surg. 1998 Jul. 33(7):1043-6; discussion 1047. [Medline]. Fromont-Hankard G, Philippe-Chomette P, Delezoide AL, Nessmann C, Aigrain Y, Peuchmaur M. Glial cell-derived neurotrophic factor expression in normal human lung and congenital cystic adenomatoid malformation. Arch Pathol Lab Med. 2002 Apr. 126(4):432-6. [Medline]. Kunisaki SM, Barnewolt CE, Estroff JA, et al. Large fetal congenital cystic adenomatoid malformations: growth trends and patient survival. J Pediatr Surg. 2007 Feb. 42(2):404-10. [Medline]. Kunisaki SM, Fauza DO, Barnewolt CE, et al. Ex utero intrapartum treatment with placement on extracorporeal membrane oxygenation for fetal thoracic masses. J Pediatr Surg. 2007 Feb. 42(2):420-5. [Medline]. Saltzman DH, Adzick NS, Benacerraf BR. Fetal cystic adenomatoid malformation of the lung: apparent improvement in utero. Obstet Gynecol. 1988 Jun. 71(6 Pt 2):1000-2. [Medline]. MacGillivray TE, Harrison MR, Goldstein RB, Adzick NS. Disappearing fetal lung lesions. J Pediatr Surg. 1993 Oct. 28(10):1321-4; discussion 1324-5. [Medline]. Cavoretto P, Molina F, Poggi S, Davenport M, Nicolaides KH. Prenatal diagnosis and outcome of echogenic fetal lung lesions. Ultrasound Obstet Gynecol. 2008 Nov. 32(6):769-83. [Medline]. Wilson RD. In utero therapy for fetal thoracic abnormalities. Prenat Diagn. 2008 Jul. 28(7):619-25. [Medline]. Illanes S, Hunter A, Evans M, Cusick E, Soothill P. Prenatal diagnosis of echogenic lung: evolution and outcome. Ultrasound Obstet Gynecol. 2005 Aug. 26(2):145-9. [Medline]. Loh KC, Jelin E, Hirose S, Feldstein V, Goldstein R, Lee H. Microcystic congenital pulmonary airway malformation with hydrops fetalis: steroids vs open fetal resection. J Pediatr Surg. 2012 Jan. 47(1):36-9. [Medline]. Peranteau WH, Adzick NS, Boelig MM, Flake AW, Hedrick HL, Howell LJ, et al. Thoracoamniotic shunts for the management of fetal lung lesions and pleural effusions: a single-institution review and predictors of survival in 75 cases. J Pediatr Surg. 2015 Feb. 50 (2):301-5. [Medline]. Tsao K, Hawgood S, Vu L, et al. Resolution of hydrops fetalis in congenital cystic adenomatoid malformation after prenatal steroid therapy. J Pediatr Surg. 2003 Mar. 38(3):508-10. [Medline]. Azizkhan RG, Crombleholme TM. Congenital cystic lung disease: contemporary antenatal and postnatal management. Pediatr Surg Int. 2008 Jun. 24(6):643-57. [Medline]. Merchant AM, Peranteau W, Wilson RD, et al. Postnatal chest wall deformities after fetal thoracoamniotic shunting for congenital cystic adenomatoid malformation. Fetal Diagn Ther. 2007. 22(6):435-9. [Medline]. Algorithm for the treatment of fetal congenital pulmonary airway malformation (CPAM). Congenital pulmonary airway malformation resection. Ex-utero intrapartum treatment (EXIT) procedure.